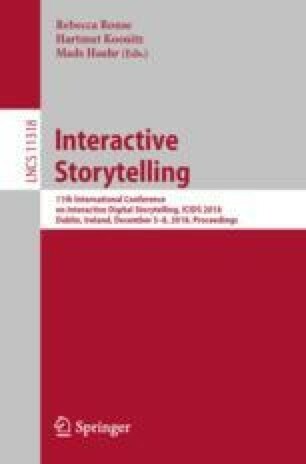 This study addresses a typically silent dimension of Interactive Digital Narrative (IDN) theory and practice – meta-communication between designer and player. Meta-communication involves directly sharing thoughts and feelings the designer and player have during the development process. We refer to this interaction as “meta-communication” to distinguish it from comments about behavior, such as mentioning options chosen and evaluations of the IDN product. To address foundational questions about meta-communication in the IDN process, we conducted a research workshop with undergraduate novice IDN designers. Participants worked through a series of Twine IDN design-play sessions and made their meta-communication explicit using a think-aloud protocol. Transcriptions of the think-aloud sessions and notes made by designers and players during the IDN design process were analyzed for expressive functions, such as stating confusion or emotion. Analyses of the IDN designs identified structural features such as nodes and connections. Results of quantitative and qualitative analyses revealed that the frequency and type of meta-communications relate to the complexity of the final product (connection density). This study contributes a practice-based research approach accounting for inter-subjective dimensions of the IDN experience, thereby adding measurable psychological constructs to IDN theory.